Definition 21: Given a curve with arc length as parameter: x(s). Let t(s) be the tangent vector, so t(s) = x .(s). Now we choose for every s a vector n(s) (called principal normal vector) with length 1 which has the same direction or the opposite direction as x ..(s), in such a way that n(s) becomes a continuous vector field. The principal normal vector keeps its length 1 and stays at one side of the curve. So for each s there is a number κ(s) so that x ..(s) = κ(s)n(s). We call κ(s) the curvature function of the given curve. The curvature changes its sign in an inflection point, and its absolute value is the length of the curvature vector. We define the curvature radius R(s) to be 1/κ(s) (∞ in an inflection point), and the curvature center to be x(s)+R(s)n(s). These are the center and the radius of the so-called curvature circle, about which we are going to speak later on. The curvature vector x ..(s) is always pointing from the point x(s) to the curvature center. ||t(s+Δs)-t(s)|| = √((t(s+Δs)-t(s)). (t(s+Δs)-t(s))) = √(2-2t(s+Δs).t(s)) = √(2-2cos(Δφ)) = 2|sin(Δφ/2)|. So |κ(s)| = ||x ..(s)|| = lim (Δs→0) 2|sin(Δφ/2)|/Δs = lim (Δs→0) Δφ/Δs. Explanation 23: About the curvature circle. The circle r(cos(t),sin(t)) becomes with arc length as parameter: (cos(s/r),sin(s/r)). Hence it follows that the curvature satisfies κ(s) = ||x ..(s)|| = 1/r. Now let x(s0) be a point of the curve x(s). Its curvature center is m(s0) = x(s0)+R(s0)n(s0). The curvature circle has parametrisation m(s0)+R(s0)(sin((s-s0)/R(s0))t(s0)-cos((s-s0)/R(s0))n(s0)) (= c(s)). So this circle lies in the plane x(s0)+λt(s0)+μn(s0) (called osculation plane or kissing plane, about which we are going to speak later on). It is passing through x(s0) and there it is tangent to x(s), and it has in s0 the same curvature as the curve x(s): see the following problem. Here are two theorems about the curvature function that we don't prove. We can prove the second one by generalizing example 27 which comes immediately after it. Proposition 25: κ(s) is invariant under motion (that is to say: invariant when the curve is stiffly moved through space). Proposition 26: With any given curvature function there is a planar curve having this curvature. 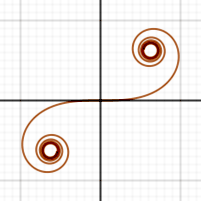 This curve is unique up to rotations and translations. Example 27: (as an illustration of proposition 26). Because ||x . (s)||=1, we have x . (s)=(cos(α(s),sin(α(s)), so κ(s)=α .(s). Hence α(s)=(1/2)s2+c and x(s)=(d∫s cos((1/2)σ2+c) dσ, d'∫s sin((1/2)σ2+c) dσ). When we choose an other c this means we rotate the curve, when we choose an other d and d' we translate the curve. For planar curves in the x,y-plane we always have: κ(s) is the derivative with respect to arc length s of the angle between the tangent vector of length 1 and the x-axis. Problem 28: Determine the curvature of the cycloid (see problems 18 and 20) as a function of s.
Problem 29: Prove that the straight lines are the curves with curvature function κ(s)=0. Thereafter, prove that, whenever the tangents of a curve go through a fixed point, or are all parallel, this curve must be a straight line.